Yoshitsune Senega is one of the unsung hero's of Okinawan uechi Ryu Karate. 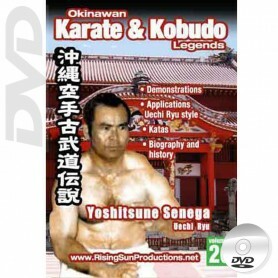 This DVD will show you why his karate is so amazing and although a humble man his karate and kobudo is some of the best ever to come out of Okinawa. You will see him demonstrate performing tamashiwara (breaking skills) makiwara and so much more. He shows his weapons skills that he learnt from Matayoshi Shinpo plus beautiful kicks and just so much more. You too will become an instant fan of Sensega an unsung hero of Okinawan Martial Arts. - Video only in English Language - Video Lenght: 28 min.